It’s critical to set yourself apart from prospect-hunting competition on LinkedIn. 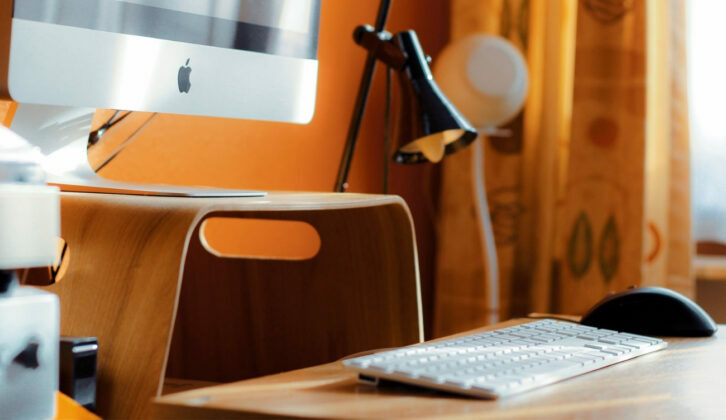 Apart from a killer LinkedIn headline, your summary is the next most important component for making a strong first impression and compelling your reader to stick around. Your summary is a prime opportunity to showcase your most relevant professional skills and accomplishments, as well as more personal details that might build a stronger relationship and pique their interest in learning more about you. So as you write, ask yourself: What are my target customers most interested in knowing about me? What details and qualities do they want to see? 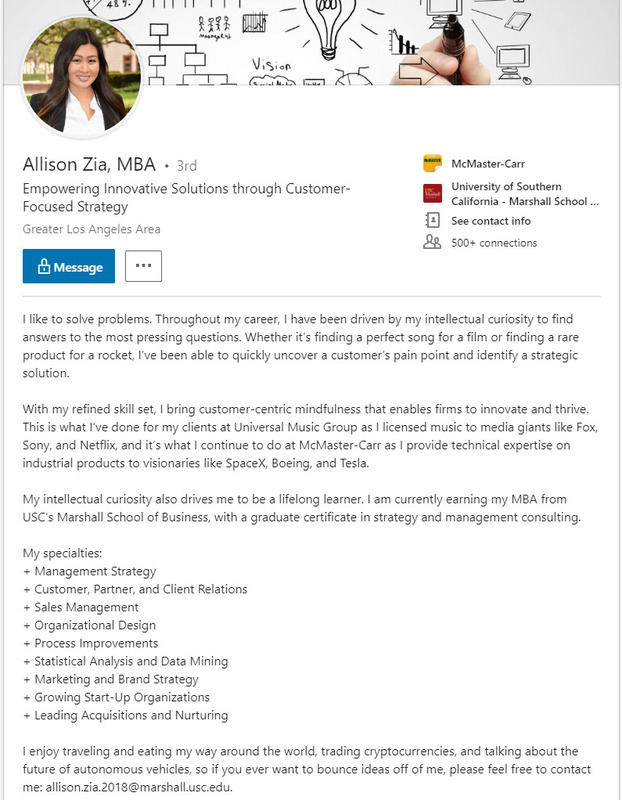 Take a look at this LinkedIn profile. The first things you should notice are the profile image, background cover, name, and headline. After that, your eyes naturally go down toward the summary. Your LinkedIn summary, therefore, is a great place to convey your value proposition to anyone looking at your profile. 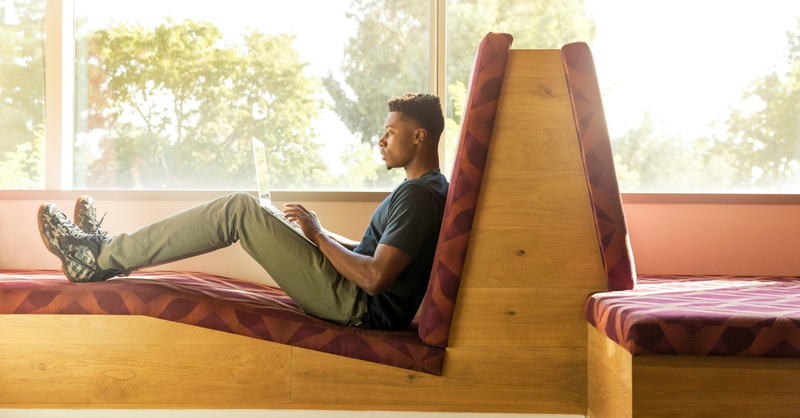 There are several ways to write a powerful LinkedIn summary—we've listed a few of our favorites below. By the time you finish reading this post, you should have plenty of ideas and inspiration for your own summary. In today’s packed online world, captivating and engaging your reader is key if you want to get any traction and reach your sales goals. That’s part of what makes storytelling so effective. In terms of a LinkedIn summary, effective storytelling weaves your skills, accomplishments, and passions into a compelling and personable snapshot of who you are and what you do. It’s not just listing off impressive things you’ve done and repurposing what’s already in your “Experience” section—it’s humanizing yourself and building meaningful connections with your prospects. Allison Zia does an excellent job of this. She starts off discussing a personal interest: problem-solving and how it helps her excel in her career. Then to cap off the personal connection she’s developed, she shares a few hobbies and interests like traveling and trading cryptocurrencies. Instead of being dry and jargon-stuffed, Allison’s summary is a breath of fresh air with just the right balance of personal and professional content. Another way to make an impact with your summary is to focus on what you can do for prospects and why they should be interested in talking to you. For example, you can write about common problems your customers face and how your expertise makes their lives easier. Show them a better way, provoke a reaction, and highlight the type of results they can expect to achieve. A customer-first sales process can increase average deal size by 16% and improve win rates by 9%, so why not try this strategy for your summary too? 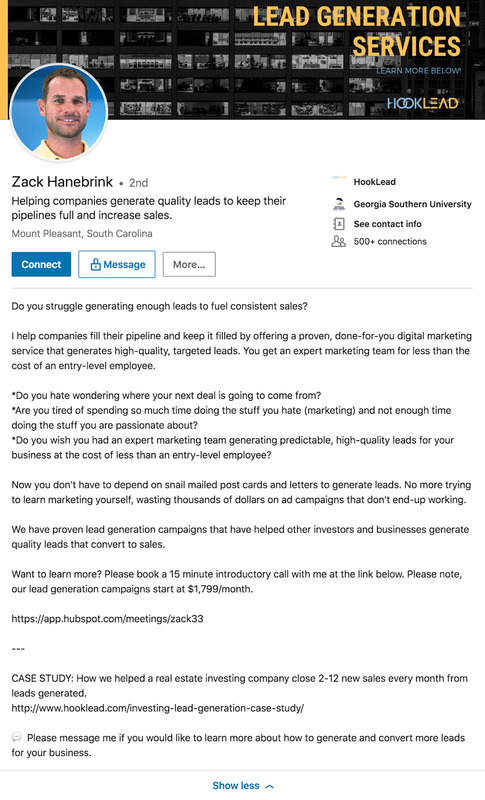 Zack Hanebrink of HookLead takes a similar approach to his summary. He immediately grabs the reader’s attention with a question and reminds them of a common problem that his target audience faces. Zack then talks about his expertise, and how he can help companies save money with proven strategies that have helped other companies and investors generate quality leads. Lastly, he mentions a case study that shows off results that other companies would want to achieve. So instead of talking about your long-term experience with a particular company, try talking about the difference you’ll make in a customer’s life. 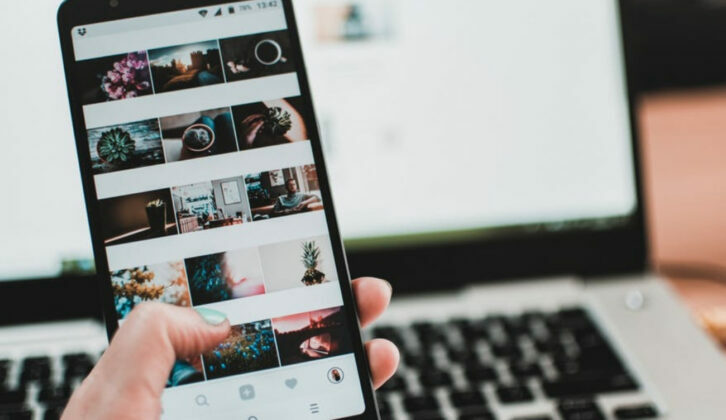 Search engine optimization (SEO) is a critical component for any online business strategy, and your LinkedIn profile is no exception to that rule. 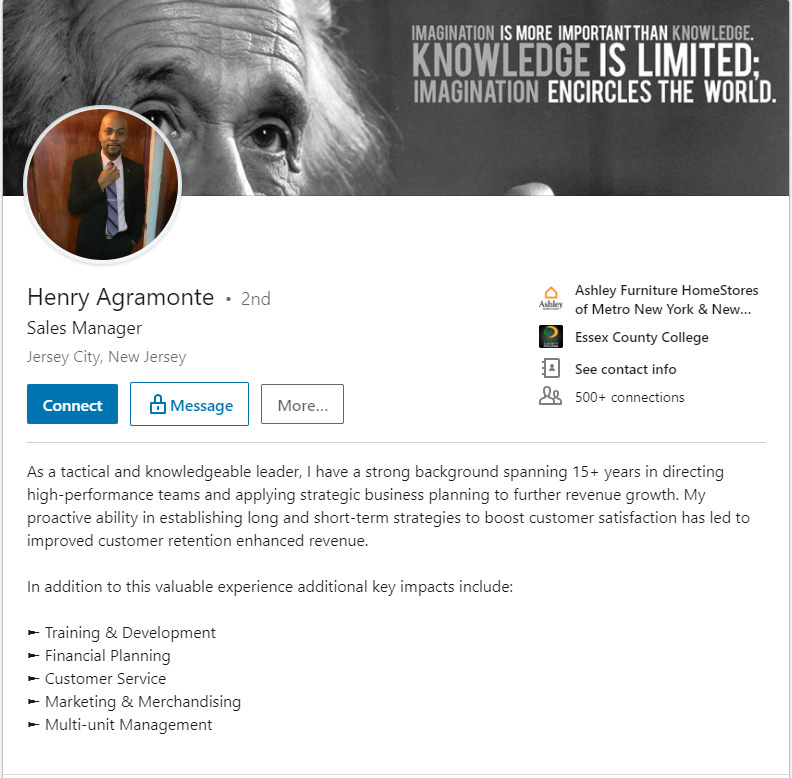 LinkedIn constantly scans the text in every user’s profile, essentially keeping an inventory of what everyone’s profile says. 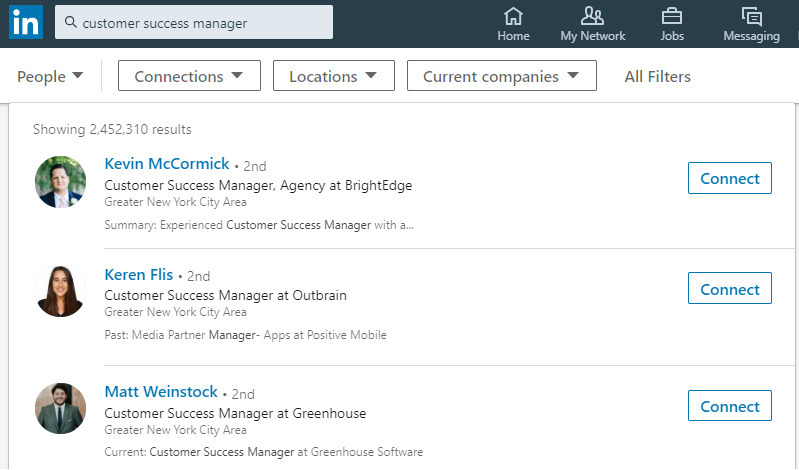 When a user types a search query into the search bar at the top of the page, LinkedIn pulls profiles that include the same keywords from those search queries. So if you’re a customer success manager, you’ll likely benefit from saying that in your profile. That way, when someone types “customer success manager” into the search bar, you’re more likely to be found. While it helps to list your title in your LinkedIn headline, keywords go farther than that. You can use your LinkedIn summary as a place to drop some of your key skills and roles, giving you a better chance of showing up in all kinds of searches that your prospects are scouting. This is on the opposite end of the spectrum from some of the examples we discussed earlier, like storytelling and strategically using keywords. Your LinkedIn summary can be just as effective with a shorter approach as it is with a longer approach. Take Fernando Moura-Silva’s summary for example. It’s only three sentences long. What’s unique is that he doesn’t use those three sentences to talk about his current role or specific professional skills. He uses them to build a relationship with his reader and show that he’s a human too. 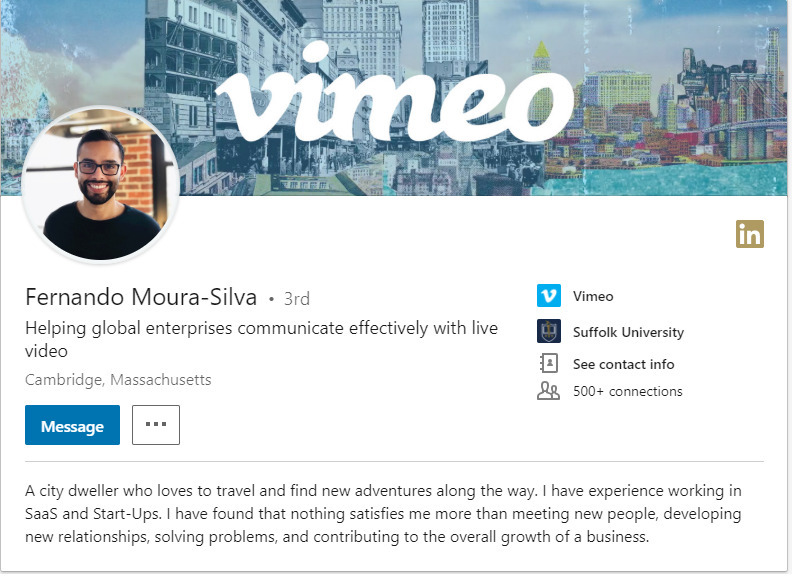 He starts off by saying he’s “A city dweller who loves to travel and find new adventures along the way.” This immediately sets him apart from most other LinkedIn users—it’s personal, not professional. He then goes on to briefly discuss his expertise in SaaS and startups, and mentions his passion for meeting new people, building relationships, and contributing to the overall growth of a company. The strategic combination of these things says that he’d love to meet and work with his prospects by solving their problems and growing their business. When it comes to simplicity and directness, it’s hard to beat Fernando’s summary. Bonus tip: Keep it scannable and easy to digest. Your prospects aren’t coming to your LinkedIn profile because they want to read a 5,000-word New Yorker article. Keeping paragraphs short, with no more than two or three sentences each. Using giant blocks of text is the fastest way to lose the attention of someone who’s in a hurry. Using bullet points and lists to group key items together. When your summary has a clean visual organization, it drastically improves the chances of your prospect seeing and absorbing the full story you’re trying to convey. Your LinkedIn summary can make or break your first impression. Use it wisely and creatively. 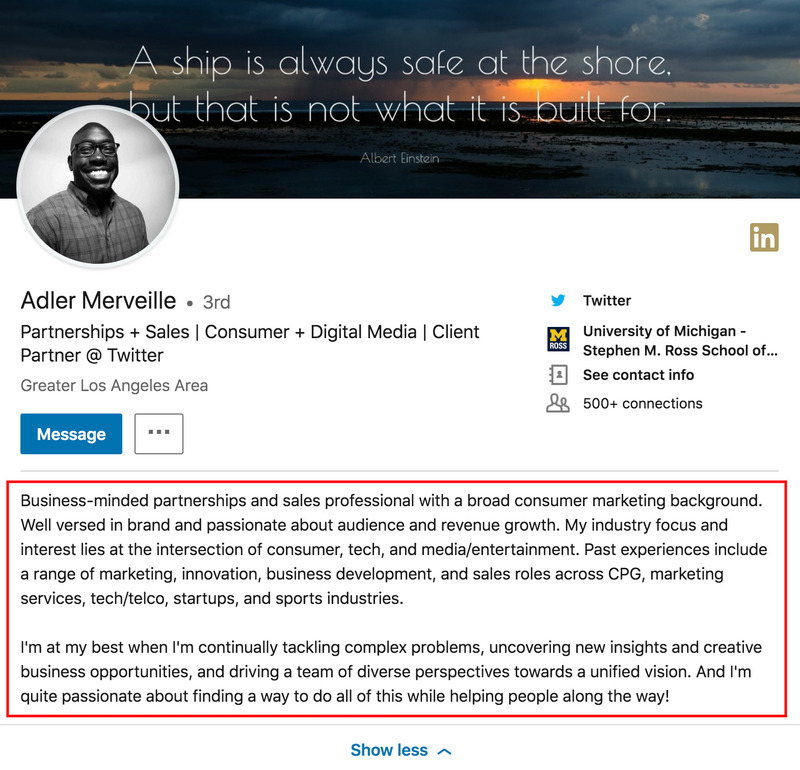 There are already a heap of predictable and boring LinkedIn summary examples out there. Instead of treating it like filler, take some time to write a genuine and meaningful summary. Your summary is your golden opportunity to prove that you’re the best fit for the job, so show your reader that you’re credible, experienced, and an overall awesome partner and resource to have on their side.